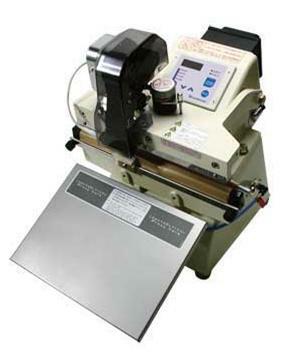 This impulse sealer combines microcomputer machine control with a highly sensitive thermocouple-based temperature control system to maintain the sealing area at the set seal temperature regardless of the surrounding work environment or increases in the unit’s body temperature. Controls heating temperature by taking direct readings from the heating element through a thin thermocouple mounted on the seal surface. This makes it possible to set the heating temperature at exactly the film’s melting point. This optimal temperature setting increases seal strength. In comparison with the previous methods used to control heat/time, the temperature of the seal surface remains constant, unaffected by temperature changes in the surrounding environment or the machine frame. Even use over an extended period of time will not affect the initially set seal parameters, allowing for consistent quality sealing to be easily maintained. Reduces unnecessary heating of the heating element, saving energy and increasing work efficiency. The lives of the routine maintenance parts are also extended, making your sealing operation more economical. Includes a variety of safety features. In the event any abnormality occurs, the unit accurately notifies the operator through buzzers and digital number displays. The optional FEP series printer (2. below) may be mounted to the unit for simultaneous coding/sealing of the pouch. Table activation is only available on the OPL-200-10, OPL-300-5 or the OPL-300-10. Two variations allow you to print on either the inside or outside of the seal. Please specify when ordering.